Art education takes place over a lifetime of observing one's surroundings. These observations may then be translated into drawings or paintings. Nature itself provides plenty of material to stimulate this reaction. Preschool coloring may encourage a child to enjoy color. And throughout life, school art classes, art museums, local art organizations, and craft activities may help develop their love of design and creativity. Whether it is interior design, photography, computer art, or fine art, learning the basics of each discipline requires some form of education. At one time, art education was taught to apprentices in an artist's studio. However, since World War II, more emphasis has been placed on obtaining a Bachelor of Fine Arts or Master of Fine Arts degree in order to pursue art professionally. A degree is necessary to teach at a public school. Art schools and colleges provide a comprehensive education for the artist, and they award art degrees. Graduation from these schools can lead to fulfilling art careers in various areas of interest. 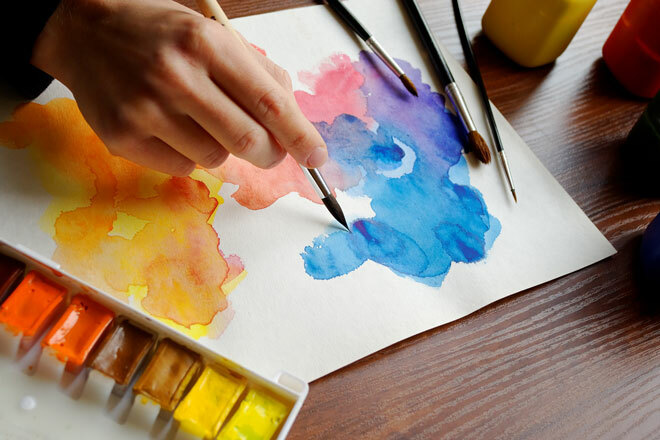 Many watercolor artists, however, are self-taught and further their technique by enrolling in watercolor classes and workshops or taking private instruction from a well-known artist. Instructional videos, CDs, and online courses are also useful to further their education. For the student, art education promotes interest in other cultures, times, and places. It crosses genders, ages, and races, and raises awareness of others. Art is also used as education for people with special needs and provides therapy for them. Many watercolor artists pursue art and continued learning for their own enjoyment, perhaps after retirement. For them, art is a leisure activity and a stress reliever; watercolor painting is not their main profession. But, through continuing practice, their education goes on; and they pass their knowledge on to the next generation of students. Discussion of various watercolor brushes, paper, paint, and techniques.